While the Papua New Guinea mens team - the Mosquitos - are the reigning champions the story is somewhat different for their female compatriots - the Flames - who are making a return to the International Cup after participating in the first ever women's division in 2011. In that competition the Flames were out gunned by the Irish, Canadian and US sides. The sole victory over the Australian Indigenous and Multicultural side. 6 years on and the Flames will be looking to make their presence more well known on the field. Queensland is a vital cog in the Talent Pathway with both boys and girls sides competing at various times in QLD state or regional championships. 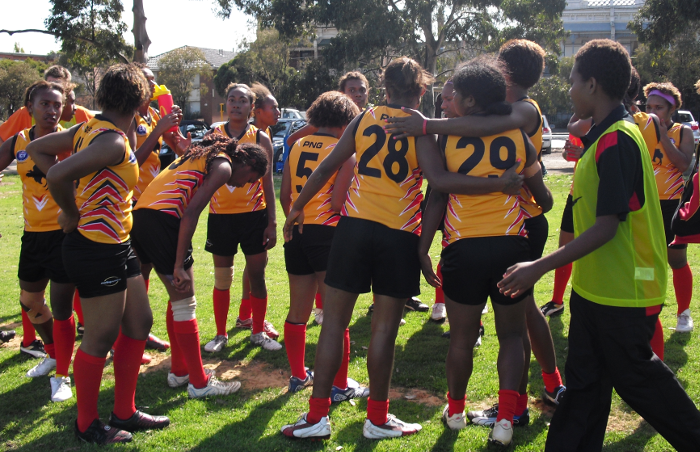 Under 14 and Under 16 PNG girls teams have regularly travelled to QLD to compete in state carnivals including the 2016 AFL Queensland Youth Girls State Championships. The PNG Flames includes a number of players with QLD experience in Brigid and Alison Gaur (Aspley), Eliana Kaputin (Zillmere) and Miriam Agita (Townsville). Strengths and Weaknesses The comparison to the USA Freedom is a fairly clear illustration of the key physical weakness. On average the US side is 9 cm taller (172 to 163) and 10 kg heavier (69 to 59). However - the Flames have youth, and perhaps pace on their side - an average age of around 21 compared to the more senior Freedom at 31. Players to Watch Taiva Lavai made the 2011 World Team and returns on the verge of her 24th birthday a more mature player. She will be keen to set the example. Look out also for the inspirational coach Johnathan Ila. The Flames will be well tested - drawn against the debutant Crusaders and then matched against the Freedom before taking on the Irish powerhouse. The Flames will be lead on field by Prudence Sindriwen from the Bomana Cats. Coach Jonathan Ila and team manager is Josephine Ila.